Hong Kong: Chinese University Press. The notion of “soft power” sounds somewhat unusual for a field as overlooked as Hong Kong arts. Unlike Taiwan or the PRC, both of which possess a strong agenda of international influence in the cultural realm, the Special Administrative Region is rarely portrayed as such. However, the reshaping of the SAR’s cultural and art institutions, combined with its growing integration with China, call for an examination of the ways in which its cultural field “intersects and reacts with the culture of the mainland” (p. XIV). 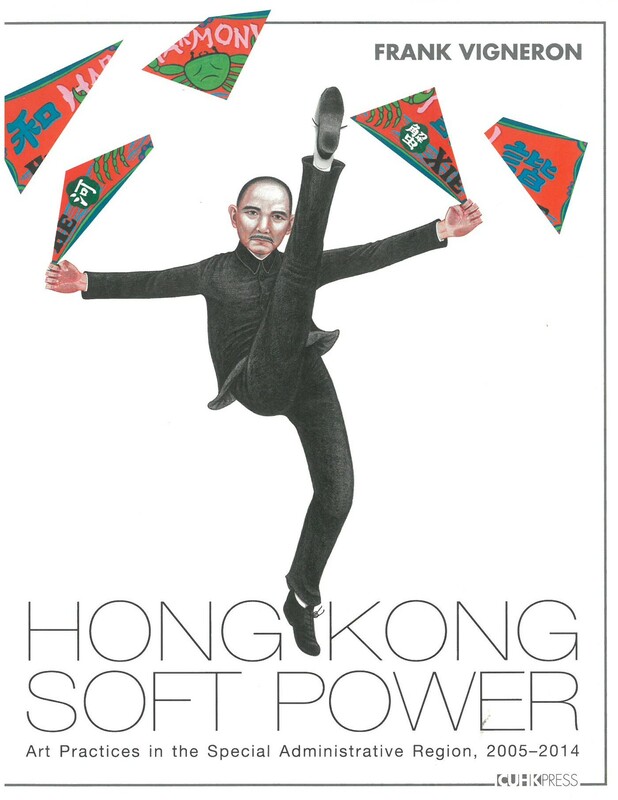 To do so, Hong Kong Soft Power looks at a vast array of recent art practices (2005-2014). The book is the result of the author’s years of engagement with a diverse local scene ranging from traditional fields such as ink and oil painting to the more contemporary installation, performance, and new media arts. Frank Vigneron holds a triple doctoral degree in Chinese Art History, Comparative Literature, and Fine Arts, teaches at the Chinese University of Hong Kong, and is a keen art practitioner as well. In this volume, he revisits, repurposes, and augments essays previously published in art periodicals and exhibition catalogues, and also addresses an important criticism raised by a reviewer of his 2010 book, I Like Hong Kong: Art and Deterritorialization (p. XVI). If his previous approach emphasised theoretical over social issues, this bias is rebalanced in this volume in favour of the latter, as we will see below. Still, aesthetic and theoretical matters take centre stage in artwork analyses, and also shape the structure of Hong Kong Soft Power. The book’s backbone is formed by the constant discussion of notions of identity and creativity, which lie at the core of Hongkongers’ art discourses and practices. The Introduction sums up the theoretical challenges posed by art teaching, exhibition, and practice in Hong Kong, and lays out the socio-political context in which they occur. Hong Kong’s art ecology and its recent institutional and aesthetic evolutions are presented in Chapter One, highlighting the specificities of art education, discourses, and practices in the SAR. While Chapter One focused on structural evolution, Chapter Two is dedicated to “sorting out the intricacies of a complex art field.” Using a Bourdieusian sociological framework, his professional insights into art pedagogy, and works from contemporary artists such as Wen Yau 魂游 and Tang Kwok-hin 鄧國騫, Vigneron attempts to disentangle the many dichotomies of Hong Kong art discourses and aesthetics (East/West, contemporary/traditional, private/public). Referring to Rosalind Krauss, he finally settles for a relational model articulating these notions together, and represents their interactions, breaks, and continuities within the art field in a useful diagram (p. 131). The book’s next sections are delineated along the dynamic forces of that diagram. Chapter Three looks at “Native” Chinese art, a category that specifically questions the notions of national culture and official art in a territory such as Hong Kong. After a detour to the mainland to see how “literati” art survives, evolves, and adapts to the changing contemporary scene, Vigneron shows that local Hong Kong artists, less influenced by top-down nationalistic debates, embrace and interpret this visual tradition distinctively. By examining the career of Tony Ng Kwun Lun 吳觀麟, who works at the crossroads of landscape painting, abstraction, land art, and installations, Vigneron shows how old binaries identified in the aforementioned diagram become irrelevant when examining actual practices. Chapter Four investigates Hong Kong’s vivid “ink art” scene and furthers this demonstration by looking at artists discussing categories of the global and the vernacular in their use of this “traditional” media. In Chapter Five, the author examines “plastician” practices, including paintings, texts, installations, performances, and new media art that question Hong Kong’s identity and discuss the idea of nation. Hong Kong’s specificity in contrast with China is further explored in Chapter Six around artworks made with participatory practices or that engage the viewer in a “relational aesthetics” (p. 312). Vigneron presents “socially engaged art practices” (p. 326), in which the artist’s role doubles with that of an observer, an activist, or a social worker, notably with heritage preservation or community building projects (Yang Yeung 楊陽, p. 304; Wooferten 活化廳, p. 328). While the reader may find that the categories subdividing the Hong Kong art field sometimes overlap, they have the merit of pointing at conundrums, and the book’s structure reveals dynamic interactions between concepts, as well as a rich hybridity and fluidity of art practices. In turns, the dialogue between these sections translates well the specificity of the Hong Kong art scene, and its understated yet complex nature. The author uses a refreshingly open theoretical toolbox, referring to Deleuze and Slavoj Žižek and also quoting at length Hong Kong artist statements as well as local critics and curators such as Oscar Ho Hing Kay 何慶基. The book’s breadth, and conversely its meticulous descriptions of art exhibitions, are two reasons to enjoy reading Hong Kong Soft Power. At once the work of a researcher, a teacher, and an art critic, it manifests the author’s intimate knowledge of the field and its actors. Many telling anecdotes help the reader grasp the specificities of the Hong Kong art microcosm. The book is also rooted in the present time, and as 2005-2014 was a period of extraordinary political tensions, it gives ample space to historical and social observations. If the period under scrutiny ends with the large-scale protest known as the Umbrella Movement, this 79-days occupation was preceded by other resistance actions and art interventions. The overlooked history of artistic engagement in Hong Kong is rightfully addressed here, especially in the last chapter. While Vigneron does not focus on “political art” in itself, he reveals the impact of politics on Hong Kong’s cultural arenas throughout the book, drawing links between local events and their repercussions on art circles. He offers a clear overview of newly-established structures hosting, fostering, or teaching art in the SAR, giving the reader rare insights into art education, and also in massive and controversial new institutions such as M+, Hong Kong’s new visual culture museum. The author also forays into art forms generated outside institutional remits, covering an impressive range of art practices and positioning by practitioners. Last but not least, although an index would have greatly enhanced the book, its numerous illustrations will help any reader become familiar with the Hong Kong art scene. Located at the crossroad of art criticism and art sociology, it is the perfect companion for those interested in delving deeper into Hong Kong’s current art scenes. Judith Pernin is a CEFC researcher and the Deputy Chief Editor of China Perspectives (judith.pernin@cefc.com.hk).